ISSTA invites you to Shannon Fields, an augmented sound walk. This project highlights the region defined by the Shannon River, on the campus of the University of Limerick. Presented through a mobile application, sounds will be activated based on your proximity to key locations. You will need a mobile phone running Android, plus headphones. Get the app from the Google Play store by searching for “Shannon Fields”. It’s by Black Bear Software. Walk the route in your own time, listening to the sounds around you, and also tuning in to the audio provided by the application. Allow yourself an hour. This project will be active for two weeks, starting 23 August 2018. 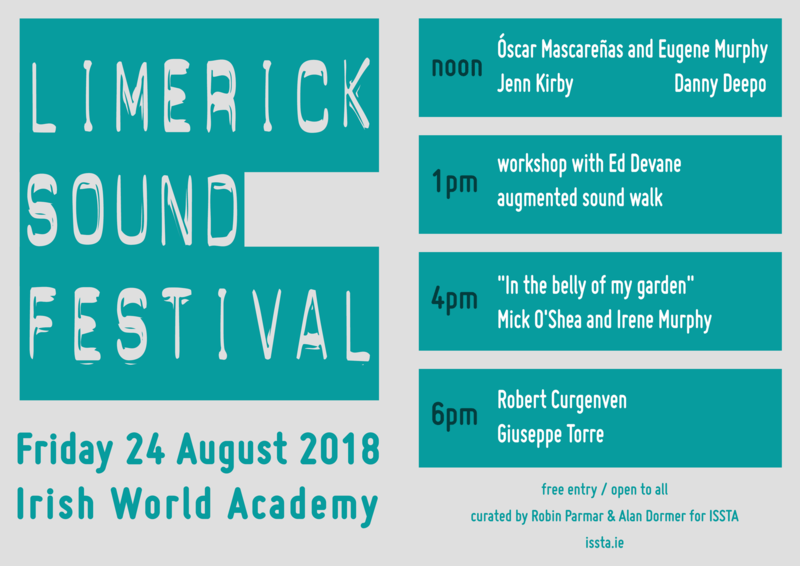 Join us for Limerick Sound Festival on Friday 24 August, when we will be walking the route and sharing our experiences. The following locations correspond to the photograph markers on the map. The total distance is just under 3 km, which will take about 90 minutes. There’s no need to do the whole walk in one go. Note that there are stairs in two places. At each place marked LISTEN you will be able to hear sounds created specially for this walk. At other places you may wish to listen to the sounds around you. This is our home and the start of our expedition. Walk towards the pedestrian bridge (behind us in this shot). Look to your left and see the Health Sciences building. Fairly science-fiction. The Living Bridge has been built to react to its environment. As you proceed, you cross the border from County Clare to County Limerick. To the right, the raging Shannon River. These photos were taken in spring when the water was at its brownest. There are five of these waystations along the bridge. The first listening point is at the third such. Looking to your right, you can see islands where swans and other birds nest. If you are lucky, a heron will fly overhead. To the left and below us, notice a path. We will follow this route in a short while. Ahead of us, to the right, is the Millstream Café. Rumour has it that this circle is a site of mystical energies. Proceed forward into the Millstream Courtyard. We will cross this to the opposite corner. Across the far side you will see sets of stairs. The exterior staircase is the most obvious. But instead, we will turn right and go down the stairs that were initially hidden from view. At the bottom of the stairs, turn left. Follow the path along the stream. Don’t cross this bridge, but keep the stream on your right. Follow the path forward through the tree cover. Otters once made their home in the banks. And maybe still? You will come to a road. Carefully cross to the trail on the other side. A Kingfisher is known to hunt this stream. Many species of plants line the banks. It’s not really a “castle” but every ruin is so called. Rest here in this alcove. This bridge was open until a few years ago. Facing it, turn right and go through the turnstile frame. This beautiful shoreline is home to those who fish the waters. Their decorated cottages are to your right. But please respect the residents’ privacy. Walking forward you can see the same road we crossed earlier. We will take the path directly ahead, underneath the bridge. Underneath the road bridge, concrete meets grass and water. Turbulent and peaceful in equal measure, the broad majestic Shannon defines the landscape. Continue along the path. This path leads us past a fishing shack, situated on the island to your left. This shack on the island is a popular fishing spot for locals in the know. Stop here and listen. Continuing along the trail, we trace the banks of the river. It’s a popular path for jogging, dog walking, and so on. Five listening spots remain. But if you need to cut the walk short, go up the trail to your right. This will take you to Otter Creek, then up the stairs to Millstream Courtyard. We now pass under the bridge we previously crossed. The sounds might be different here. The riverbank serves an important function by cleaning the waters of debris. The call of crows might alert you to their home above. A throne fit for a woodland queen. Slightly further down the trail, a wooden path to your right will take you back onto the campus. A sculpted stream bed lies to your right. When you get to the concrete wall, turn right and go up the stairs. The footpath will take you to this stately house. Turn left just before it, on the gravel path. With Plassey House on your right, walk into the square defined by the Main Building. Walk straight ahead, keeping the fountain on your right. The path will take you around the perimeter of the building. When you see glass doors in front of you, turn right. This Giant will tower over you. Looking back and to your right, you can see the fountains and Plassey House. But continue straight on, towards the next corner of the building. You will see a small door, almost hidden in the corner. Enter here. You will find yourself in a narrow hallway. Take the first right. This is your view. Continue on to the end, where a sitting area opens to your right. Instead, go left towards the light. You are now overlooking the foyer of the Main Building. Listen here, and also below, at the foot of the curved stairs. Then exit these main doors. Ahead of you is a large plaza. Walk forward and left, towards the library. A strange silent figure will be your guide. Turn around completely to face this rather grim figure. This is the final official listening spot. Walk forward and left slightly, passing underneath a pedestrian walkway. Continue straight on, between buildings, across this road. To your left are statues, and ahead is Millstream Courtyard. You have returned to the Courtyard. Veer right and walk back over the Living Bridge to the World Academy. This walk was created by Robin Parmar, using technology developed by Alan Dormer.